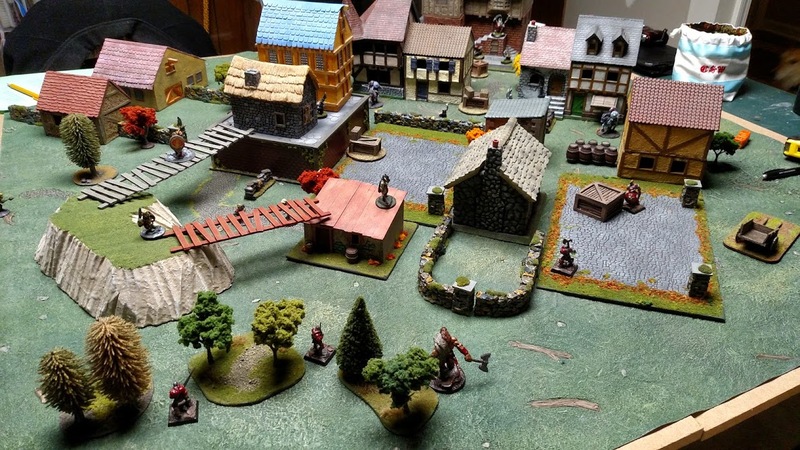 For my second go at Open Combat, the fast-play skirmish ruleset from Second Thunder, I put together a multiplayer game. 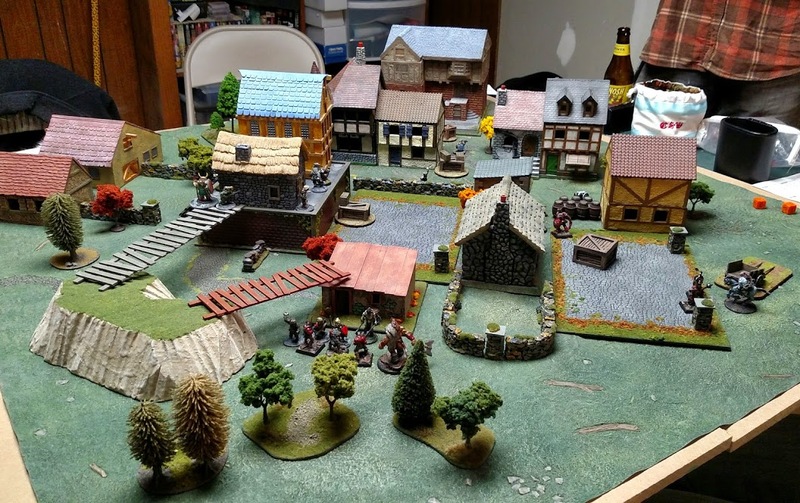 Karl, Tim and Mattias showed up with appropriately evil warbands (I was fielding my newly painted chaos ratmen), so we crafted a scenario whereupon the four warbands converged onto an eerie deserted city, its populace fled in terror. 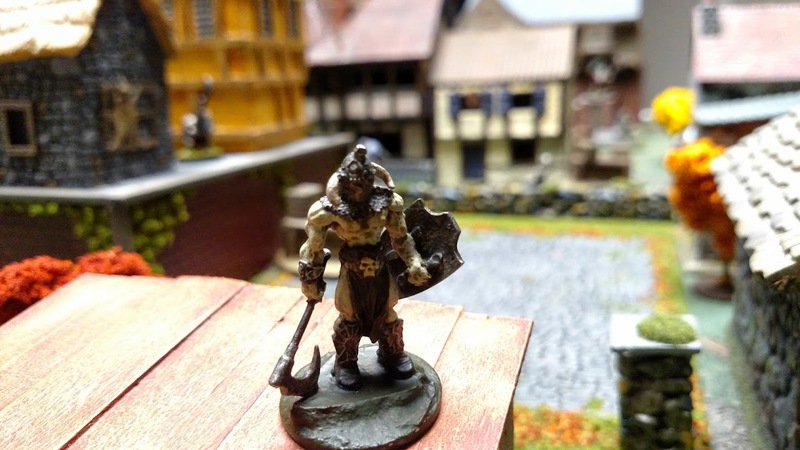 The four warbands were jockeying for control over four key locations: the Guild Hall, the Blacksmith’s Forge, the Forest and the Old Town. These locales were more or less distributed evenly across the battlefield. 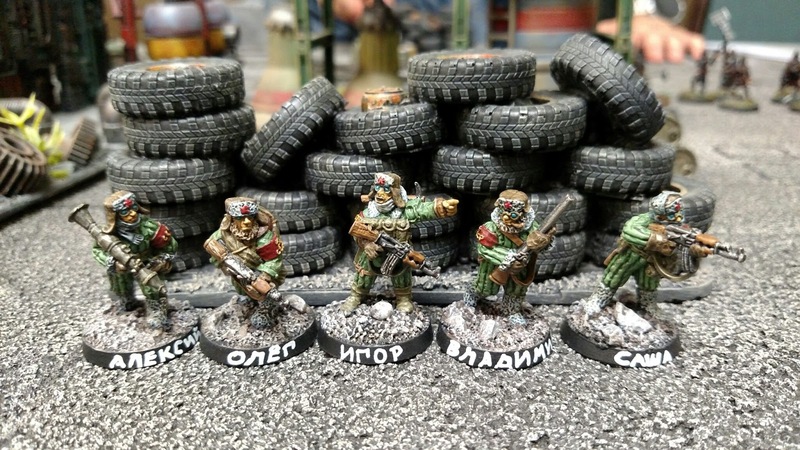 We used the “Confrontation” deployment rules, where each player took turns placing individual figures anywhere on the map, no closer than 8 inches to another opposing figure. Using this method, we were able to seize strategic locations and put ourselves in position to fight it out rather quickly, which is always nice. 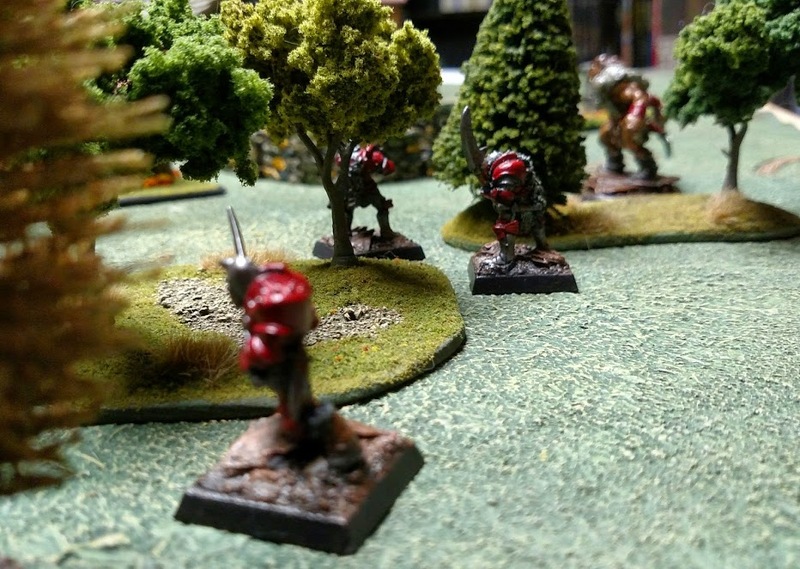 Karl’s red-armored chaos knights deployed near the forest. 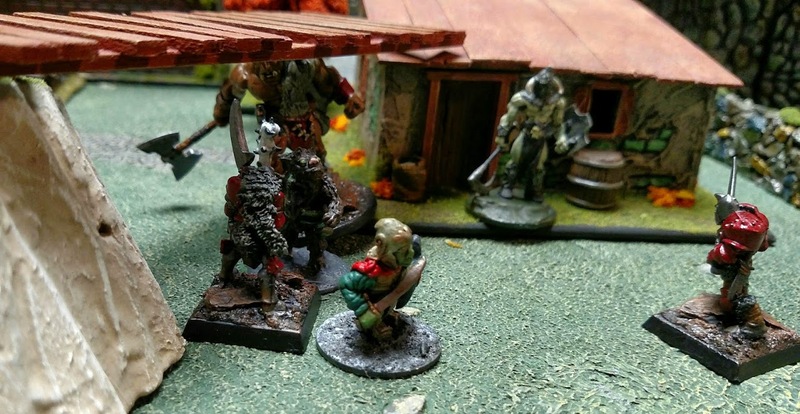 Tim’s orcs (led by a fearsome armored man known only as the Death Dealer) took up positions near the two elevated walkways. My chaos ratmen seized the Old Town (the raised section of buildings) and the Guild Hall (large multi-story building in the center rear). 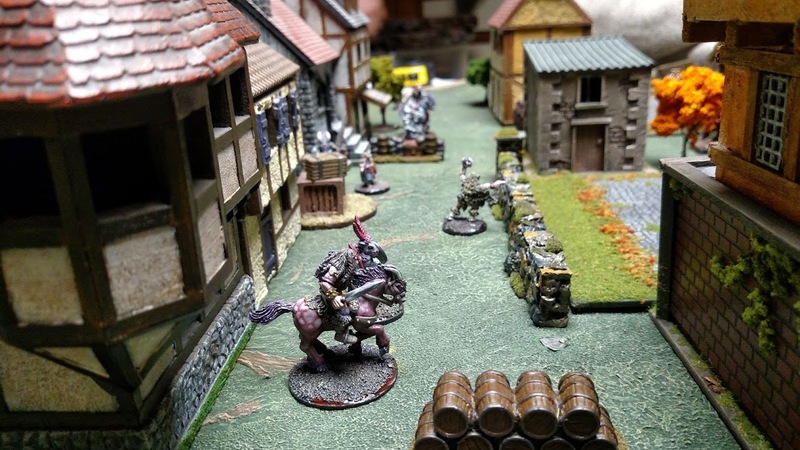 Mattias’s Wyrdwold riders occupied the long street between the Guild Hall and the Old Town. We used a simple card activation system to inject a little uncertainty into each turn. As the game began, each sector of the battlefield saw its own conflicts develop. 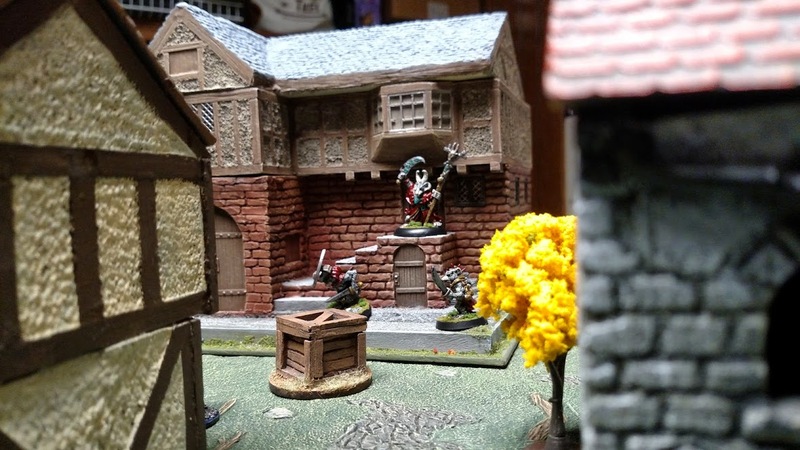 Tim began moving his troops along the walkway to engage the chaos ratmen in the Old Town section. 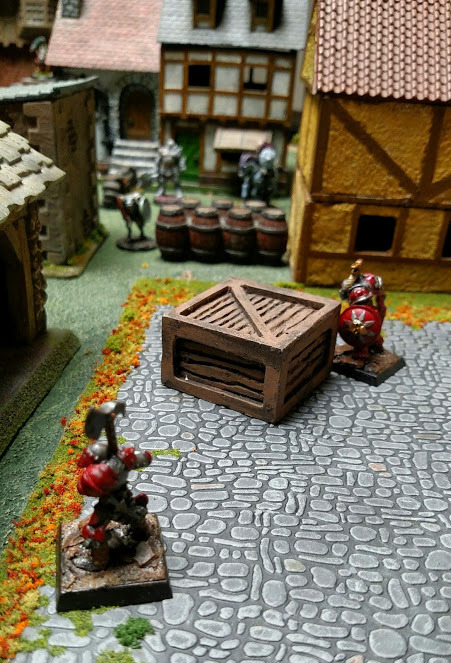 The movement rules in Open Combat don’t allow friendly figures to move “through” each other, so my armored rat was able to bottleneck Tim’s advance along the ledge quite nicely…for a little while, at least. 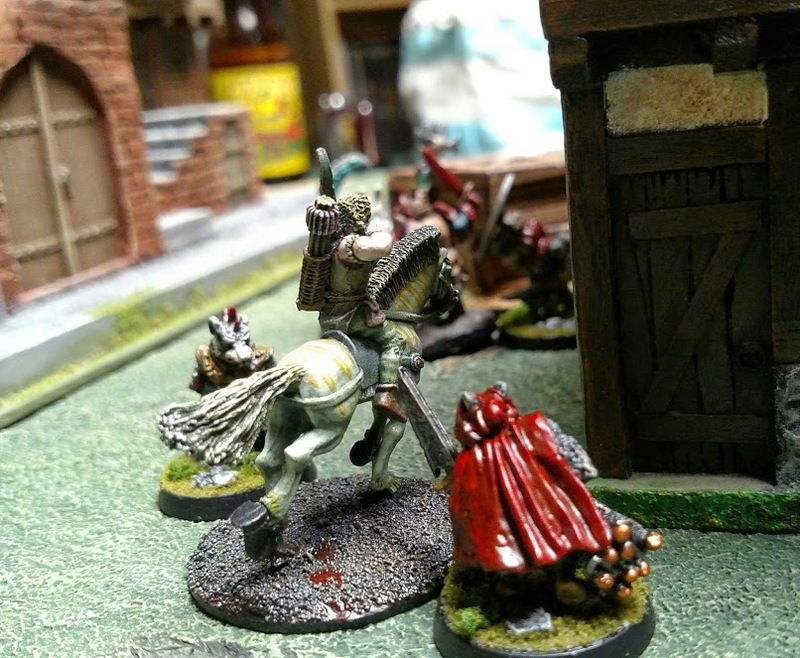 Elsewhere, Mattias’s grim horsemen thundered through the streets and clashed with the ratmen occupying the Guild Hall. 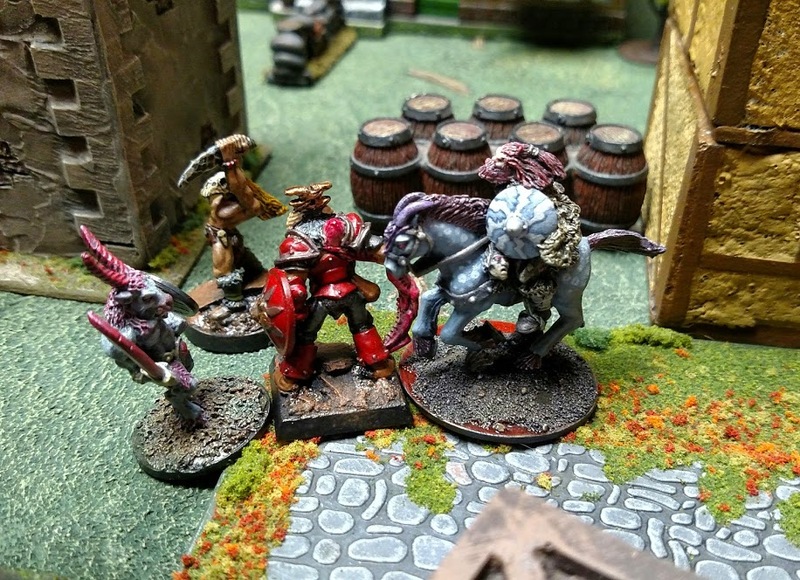 The battle for the Guild Hall (which lasted for most of the game, with plenty of negotiation and backstabbery along the way) showed one of the minor weak points of Open Combat — the lack of any established army lists or premade units. Since we were building our armies in a vacuum using a point system that didn’t really have baseline stats for a typical human soldier, I ended up building my ratmen to be slightly beefier than Mattias’s cavalry. We agreed that this felt weird since the stats we came up with didn’t match up with the way the miniatures looked, at least in comparison. 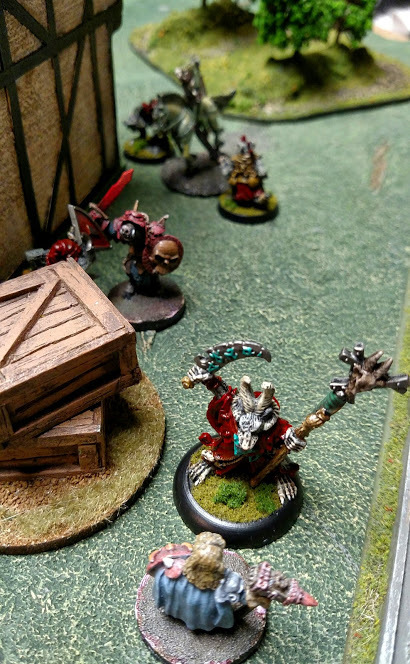 Our lists were perfectly balanced at 200 points each, but in single combat, my ratmen were more deadly than his chaos warriors — many were slewn over the course of the game, and Mattias gleefully announced each fallen warrior by name. 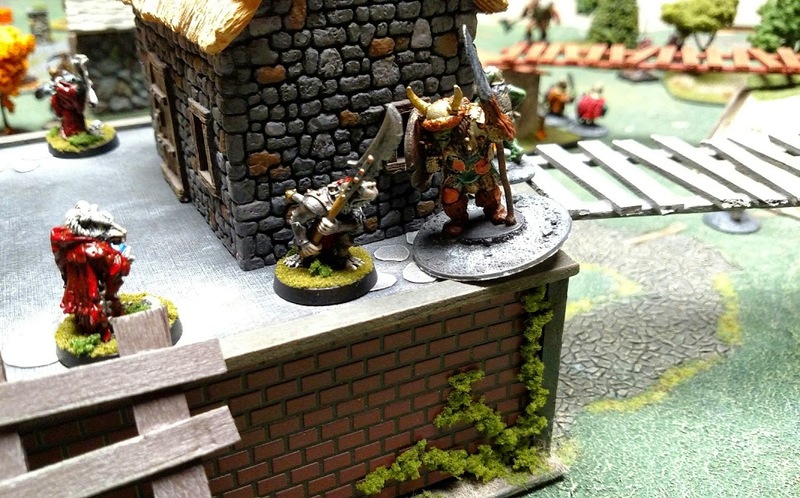 Over by the Blacksmith’s Forge, Karl’s chaos raiders met the rest of Mattias’s Wyrdwold raiders in a desperate scrum. As you can see, things got ugly pretty fast. But the bulk of Karl’s force was committed to the forest, and they formed up to present a red-armored wall against the probing attacks of Tim’s orcs. 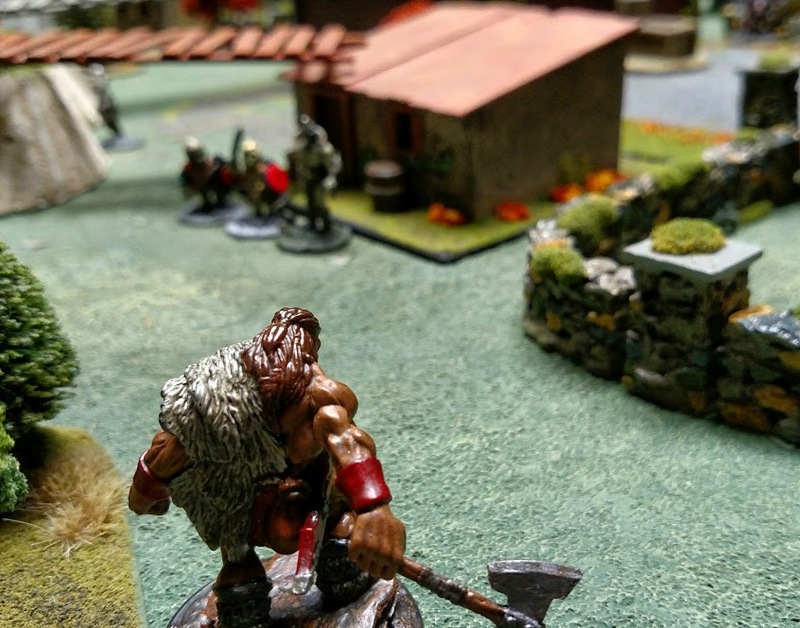 Here’s another panoramic shot, showing Karl’s chaos raiders closing in on Tim’s orcs in the foreground. And here’s what happened moments later, as the fight developed under the walkway. 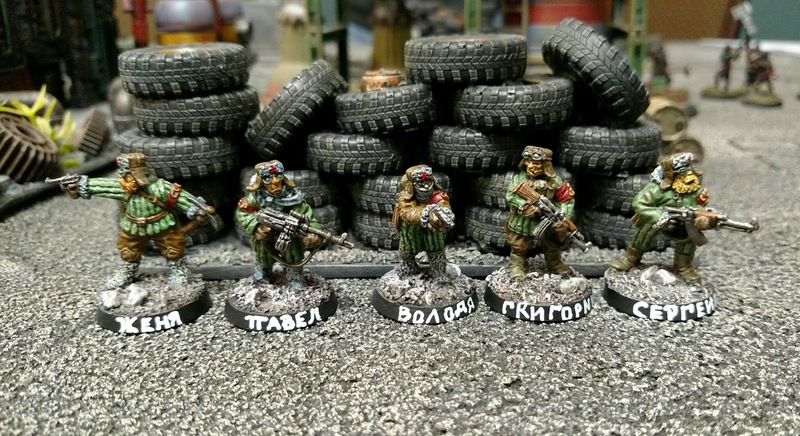 As we approached the endgame, Mattias realized he should have deployed his horsemen closer together, as they were individually annihilated in the deserted streets of the city. 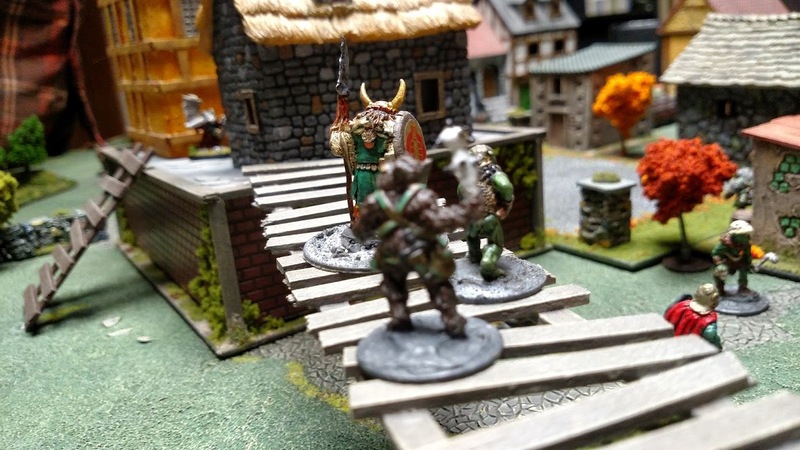 With the streets around the Guild Hall cleared of foes, my ratmen celebrated on the steps. 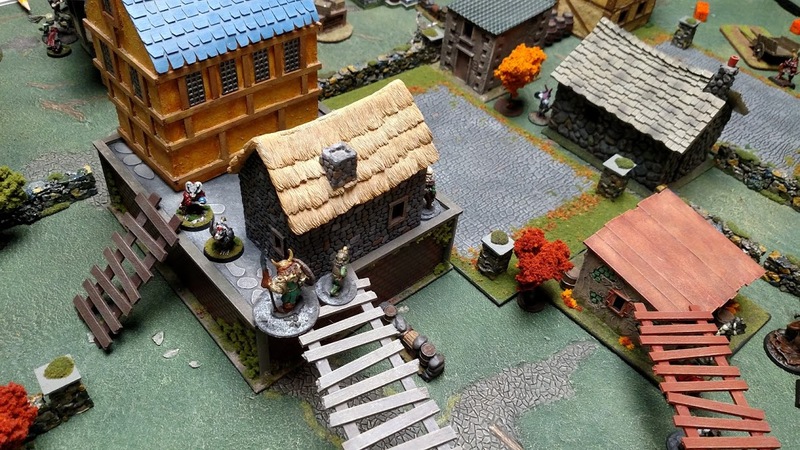 Elsewhere, Tim pressed his attack in the elevated Old Town section, slaying the armored rat and leaving just a couple of rat spellcasters as defenders. Open Combat lacks an official section for magic, but the game designer intended for players to use a variety of psychological skills to represent magic spells and other effects. We’ve found that this works well, as there are “skills” that represent plenty of things that might otherwise be covered by magic. In this little clash, my rat wizards tried to destroy the orcs’ Mind statistic, but Tim happened to have an orc shaman who buffed his buddies by boosting their Mind stat whenever I attacked it. 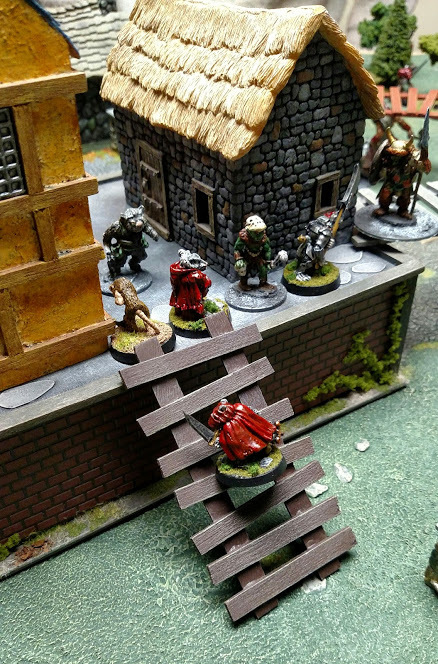 Here’s the final scene at the Old Town, where my sneaky rat managed to race across the battlefield and climb halfway up the ladder to relieve his beleaguered fellows … alas, the game ended at that point. We took stock of the victory conditions and found that Karl had won a clear victory by controlling the Blacksmith’s Forge and the Forest. I came in second place by controlling the Guild Hall. Afterward we reflected on Open Combat. 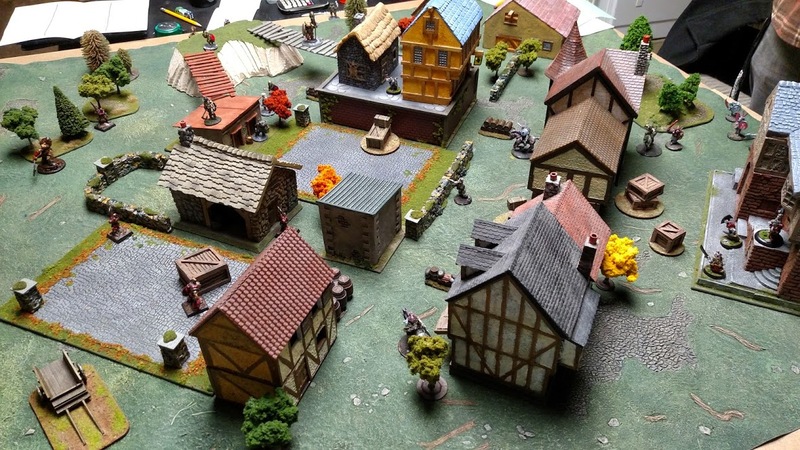 As with our previous musings, we were pretty much in agreement that the core game is solid and quite playable, but it lacks many of the peripheral elements that go into a full-fledged fantasy wargame. Of course, this is by design — the game is intentionally designed to be 100% generic and useable for a variety of historic and fantasy genres. But I’m definitely interested in a dedicated fantasy supplement with rules for magic, armor, monstrous abilities, racial characteristics, dungeoncrawling, etc. Here’s hoping that Second Thunder has something like that on the release schedule this year!